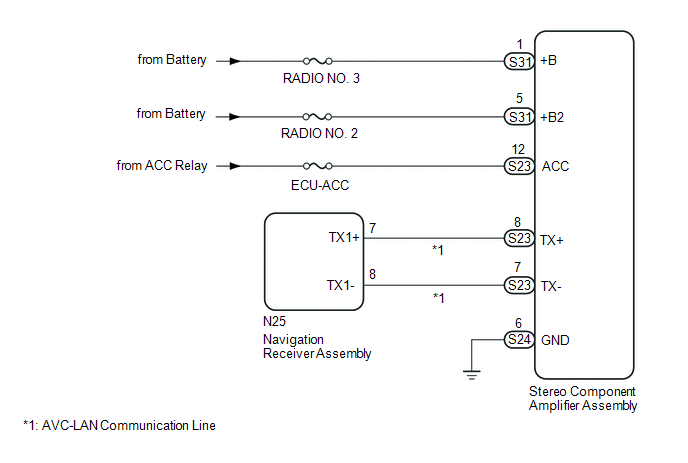 The navigation receiver assembly and stereo component amplifier assembly are connected by the AVC-LAN communication line. When an AVC-LAN communication error occurs between the navigation receiver assembly and stereo component amplifier assembly, this DTC will be stored. Stereo component amplifier assembly is/was not connected while the ignition switch is ON or ACC. Communication between the master unit and the stereo component amplifier assembly is not possible when the engine is started. *1: Even if no fault is present, this DTC may be stored depending on the battery condition or engine start voltage. 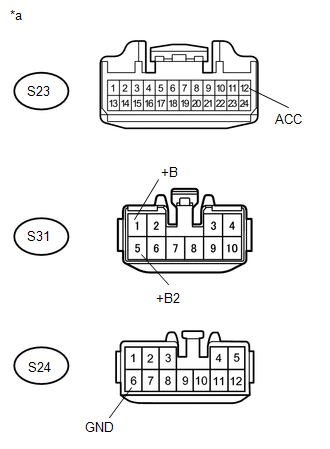 (a) If DTC B15C3 is output, perform the troubleshooting of DTC B15C3 first. (a) Disconnect the stereo component amplifier assembly connectors. (a) Replace the stereo component amplifier assembly (See page ). (c) Recheck for DTCs and check if the same DTC is output again.